The TYLT Band Car Charger is a tangle-free car charger that charges mobile smart devices. It plugs into the user’s auxiliary power outlet and provides fast charging to two devices simultaneously. 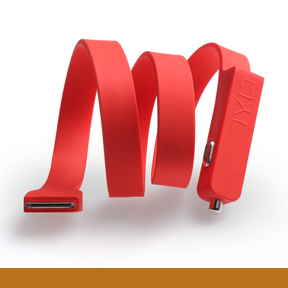 The two-foot band is available in micro-USB or Apple 30-pin with a built-in USB-plugin for a second device. Designed by Gadi Amit, Inbal Etgar, Quinn Fitzgerald, Solene Bourgeois and Brandon Warren of NewDealDesign LLC.